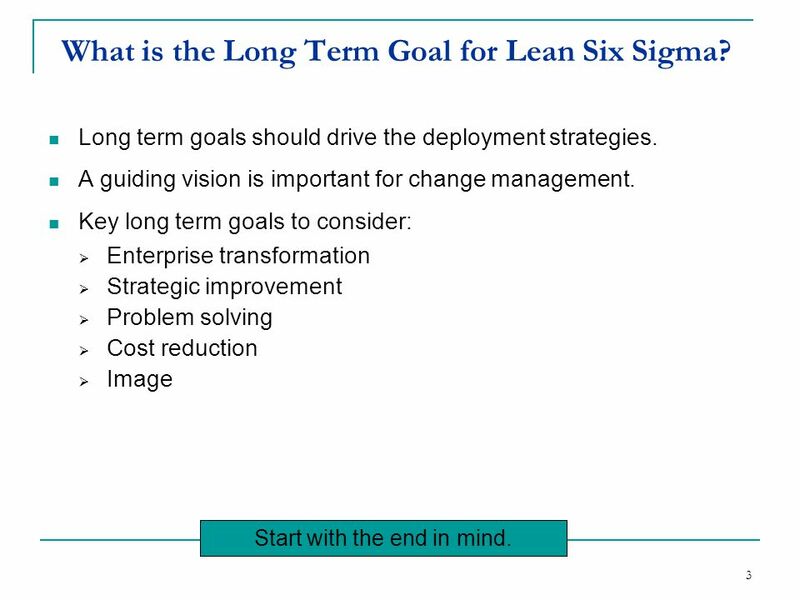 3 What is the Long Term Goal for Lean Six Sigma? 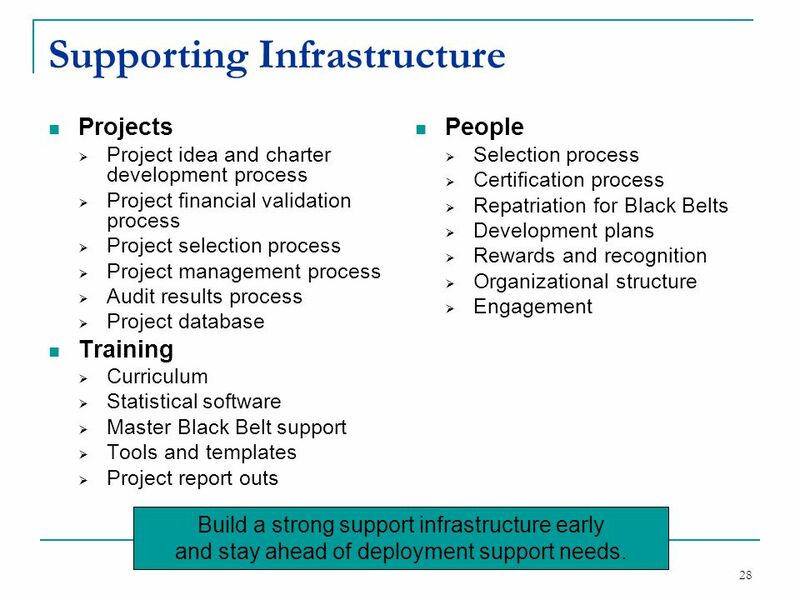 Long term goals should drive the deployment strategies. 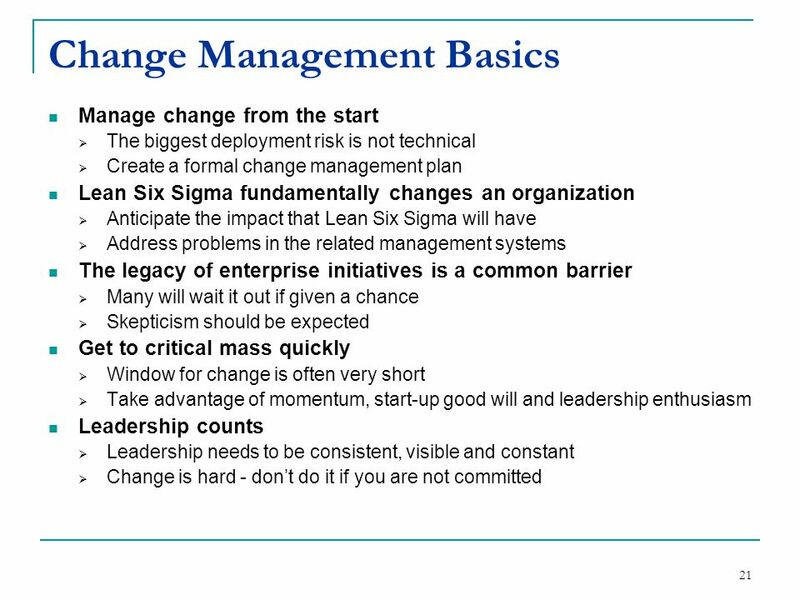 A guiding vision is important for change management. 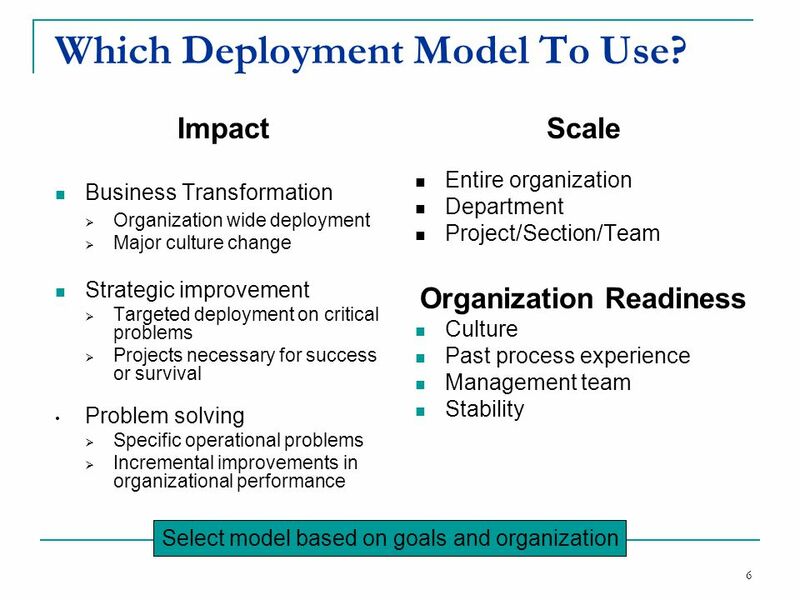 Key long term goals to consider: Enterprise transformation Strategic improvement Problem solving Cost reduction Image Start with the end in mind. 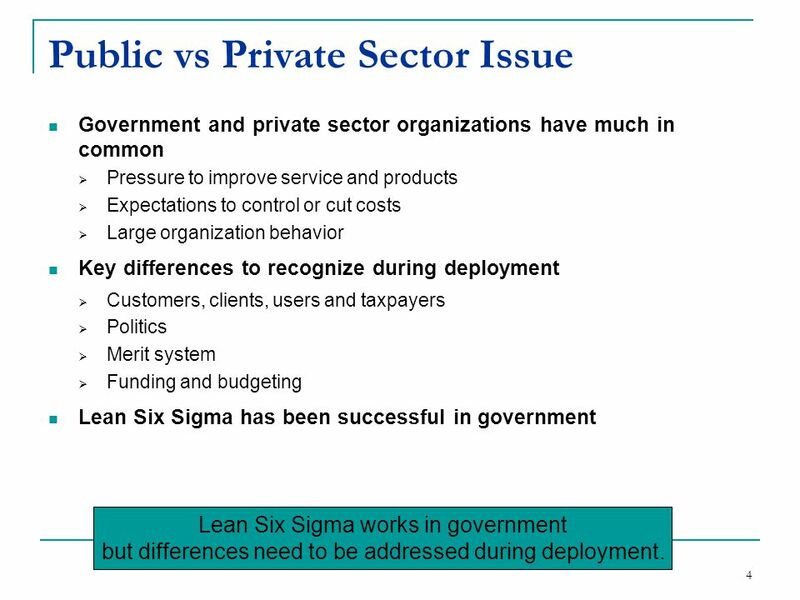 Government and private sector organizations have much in common Pressure to improve service and products Expectations to control or cut costs Large organization behavior Key differences to recognize during deployment Customers, clients, users and taxpayers Politics Merit system Funding and budgeting Lean Six Sigma has been successful in government Lean Six Sigma works in government but differences need to be addressed during deployment. 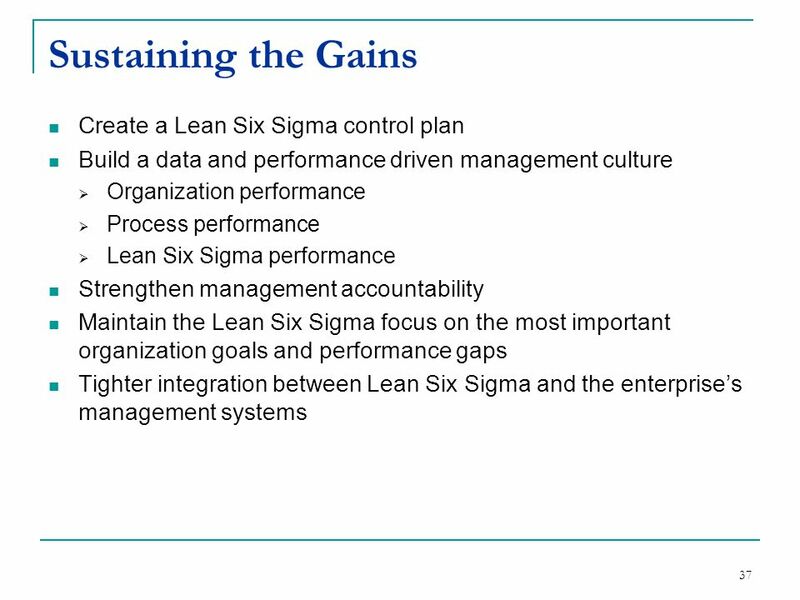 5 How Does Lean Six Sigma Fit ? 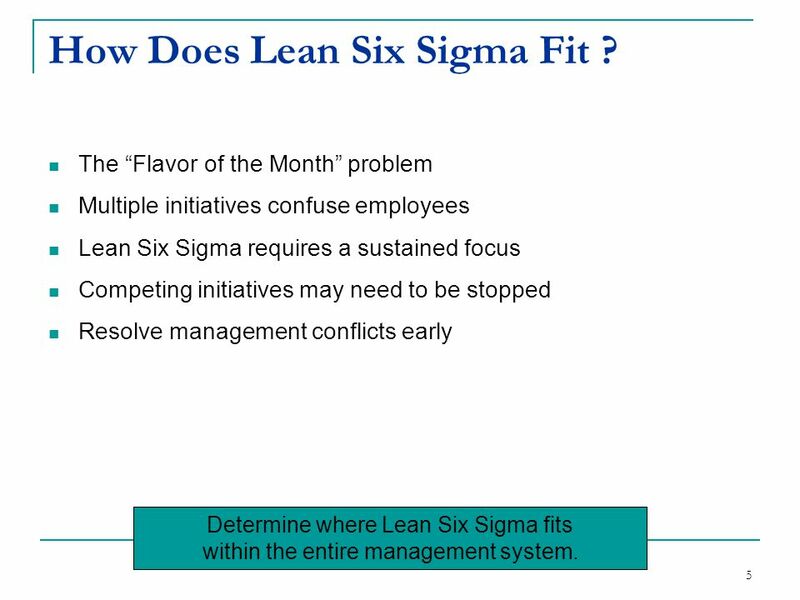 The “Flavor of the Month” problem Multiple initiatives confuse employees Lean Six Sigma requires a sustained focus Competing initiatives may need to be stopped Resolve management conflicts early Determine where Lean Six Sigma fits within the entire management system. 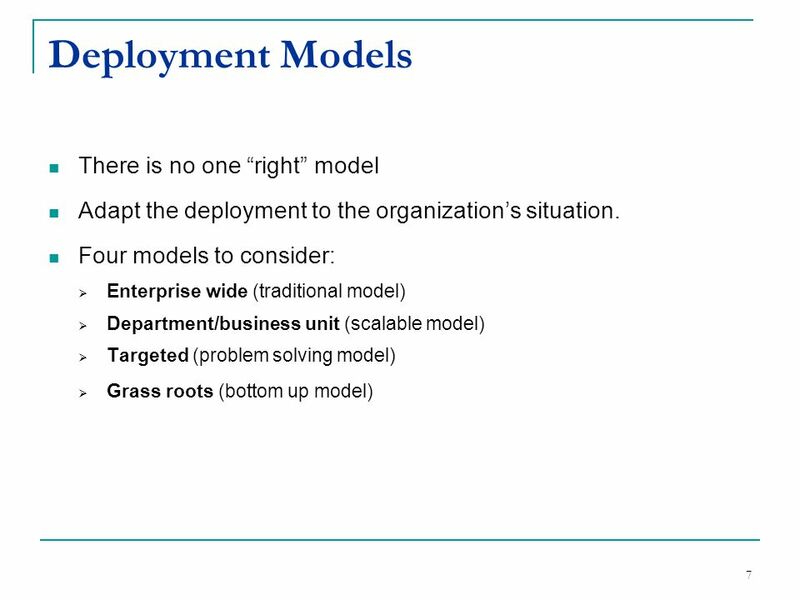 6 Which Deployment Model To Use? 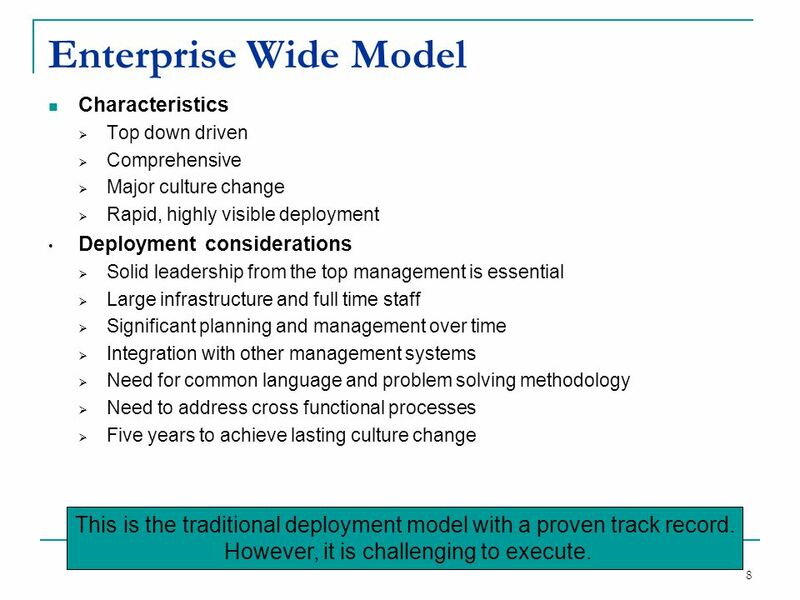 8 Enterprise Wide Model Characteristics Top down driven Comprehensive Major culture change Rapid, highly visible deployment Deployment considerations Solid leadership from the top management is essential Large infrastructure and full time staff Significant planning and management over time Integration with other management systems Need for common language and problem solving methodology Need to address cross functional processes Five years to achieve lasting culture change This is the traditional deployment model with a proven track record. 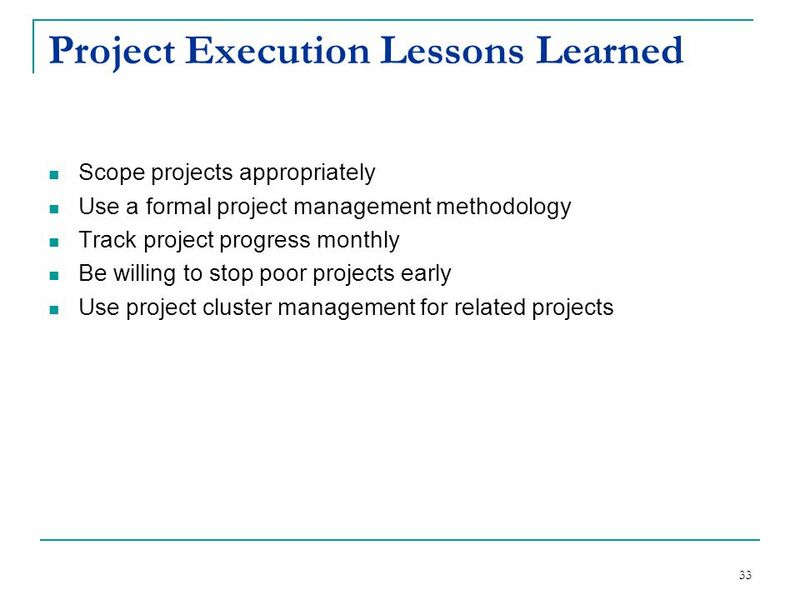 However, it is challenging to execute. 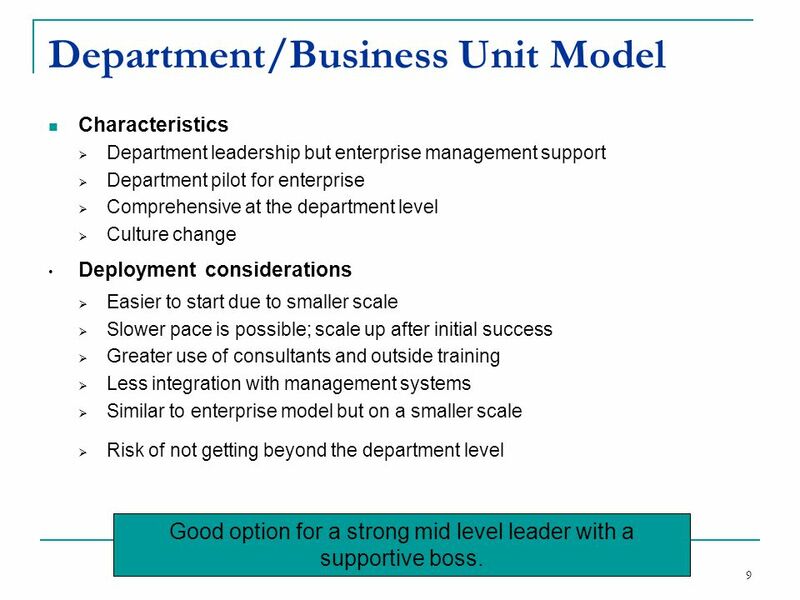 Characteristics Department leadership but enterprise management support Department pilot for enterprise Comprehensive at the department level Culture change Deployment considerations Easier to start due to smaller scale Slower pace is possible; scale up after initial success Greater use of consultants and outside training Less integration with management systems Similar to enterprise model but on a smaller scale Risk of not getting beyond the department level Good option for a strong mid level leader with a supportive boss. 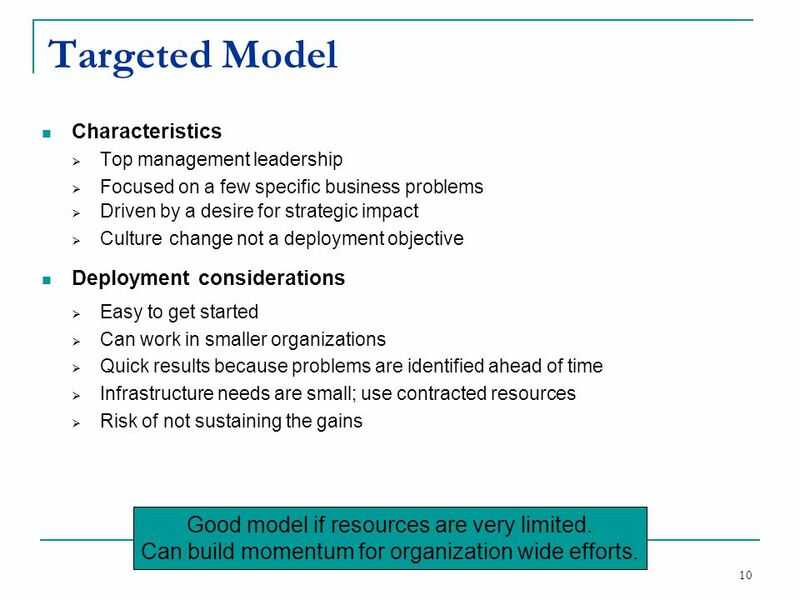 10 Targeted Model Good model if resources are very limited. 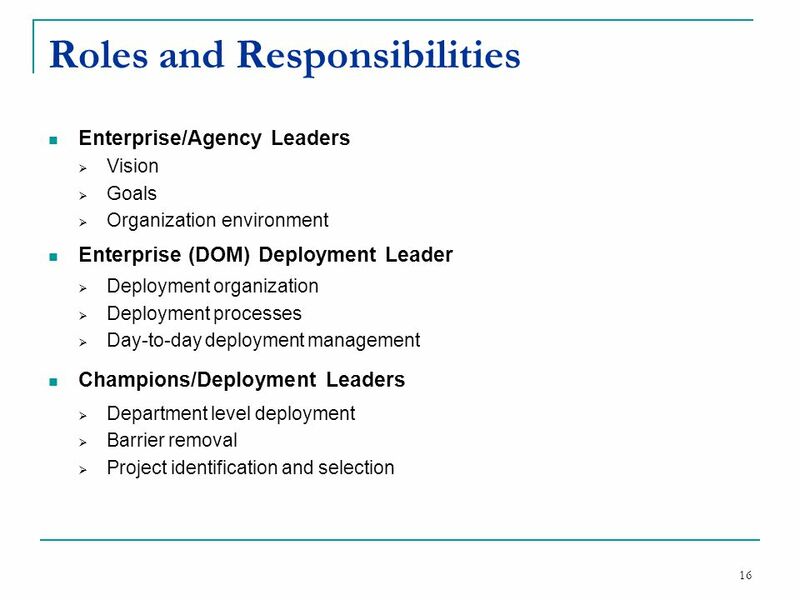 Characteristics Top management leadership Focused on a few specific business problems Driven by a desire for strategic impact Culture change not a deployment objective Deployment considerations Easy to get started Can work in smaller organizations Quick results because problems are identified ahead of time Infrastructure needs are small; use contracted resources Risk of not sustaining the gains Good model if resources are very limited. 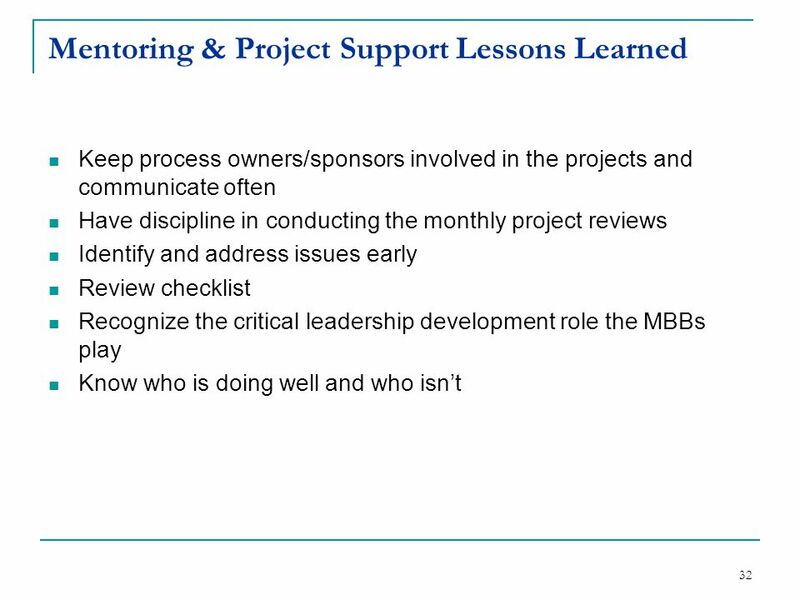 Can build momentum for organization wide efforts. 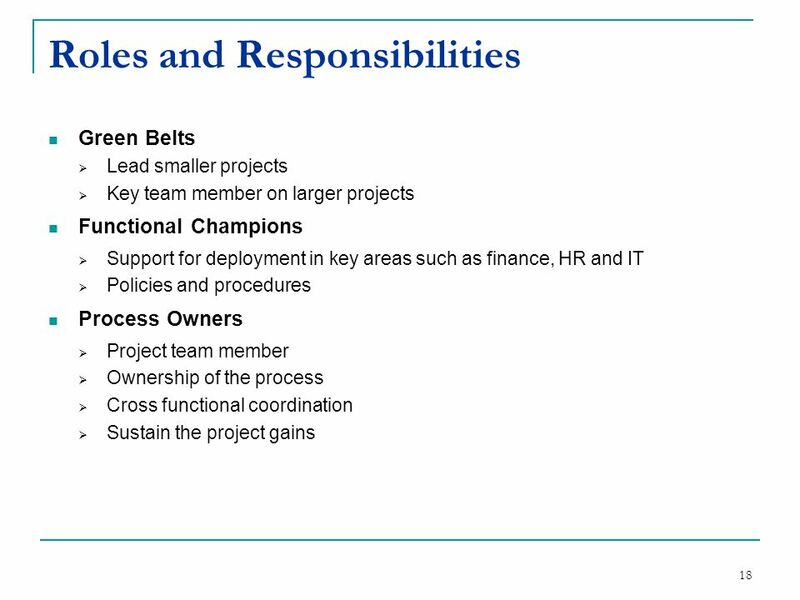 Originates at the bottom of the organization Highly motivated individuals lead the effort Project or problem specific Culture change not an objective Deployment considerations Easy to do Track record for sustainable improvement is not good Few if any infrastructure needs Big success can lead to using other deployment models. 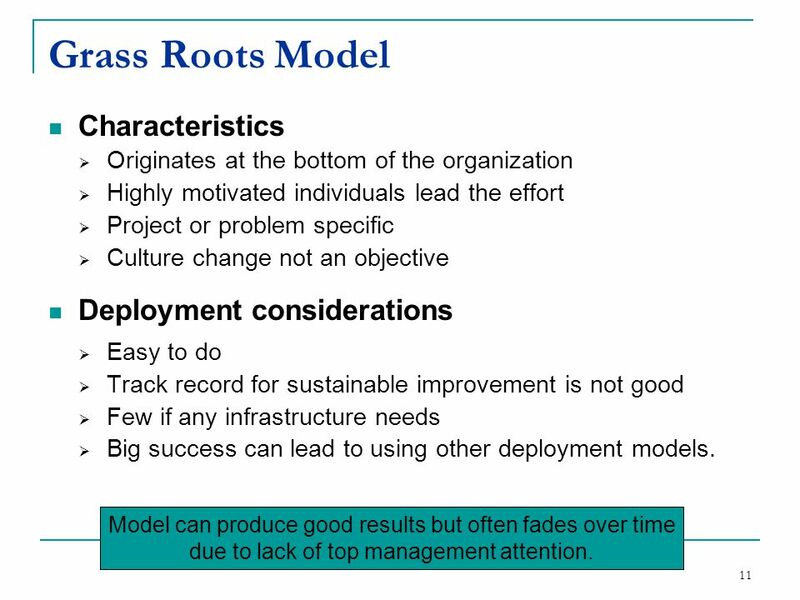 Model can produce good results but often fades over time due to lack of top management attention. 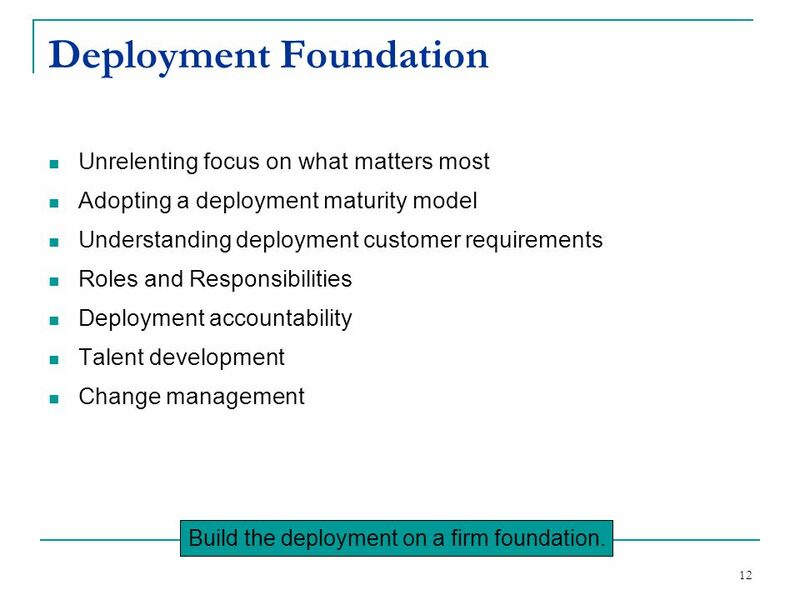 Unrelenting focus on what matters most Adopting a deployment maturity model Understanding deployment customer requirements Roles and Responsibilities Deployment accountability Talent development Change management Build the deployment on a firm foundation. 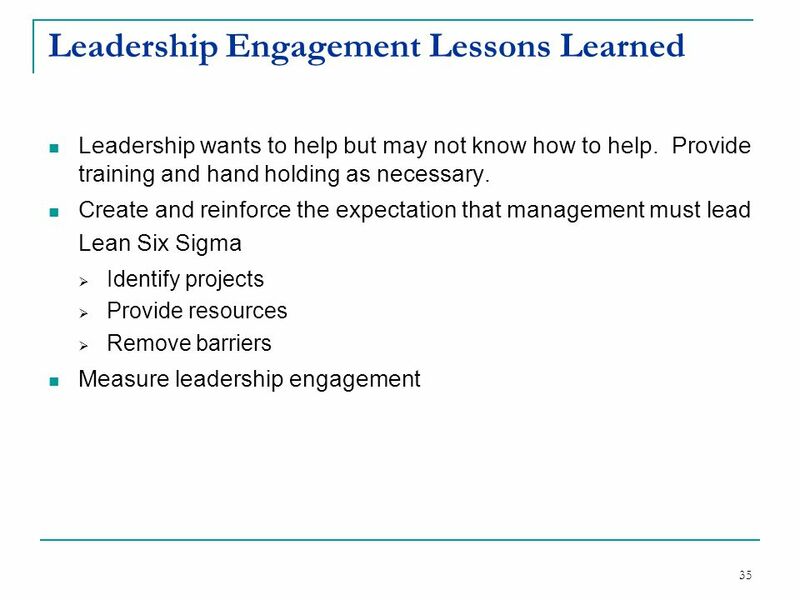 Fully engage leaders in Lean Six Sigma Require leaders to be highly visible in leading Lean Six Sigma Structure engagement in key deployment activities Lean Six Sigma goal setting Identify the most serious business problems Set explicit Lean Six Sigma goals Link to pay and job performance appraisals Understand the business goals and the major organization drivers Get leaders to understand their customer requirements Put deployment accountability where it belongs Executives and managers need to own Lean Six Sigma The deployment strategy needs to get executive ownership quickly Keep Lean Six Sigma relevant to the leaders! 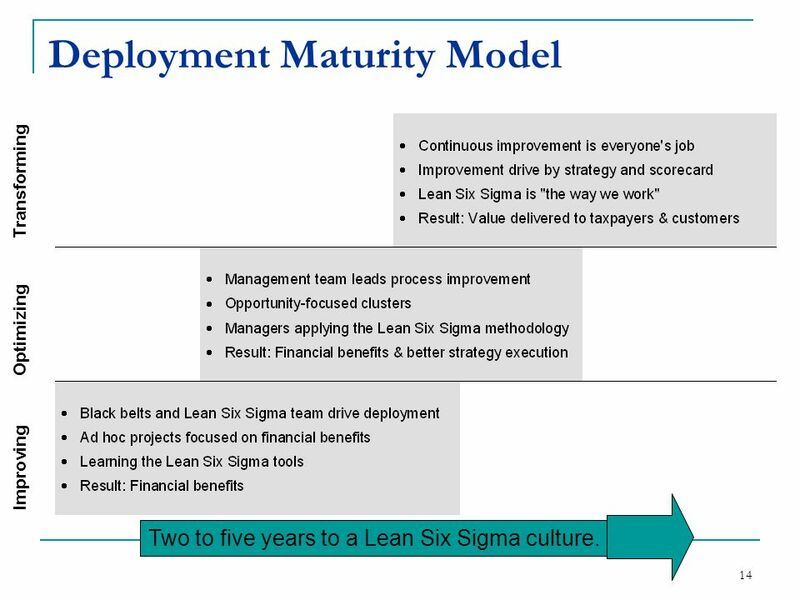 Transforming Optimizing Improving Two to five years to a Lean Six Sigma culture. 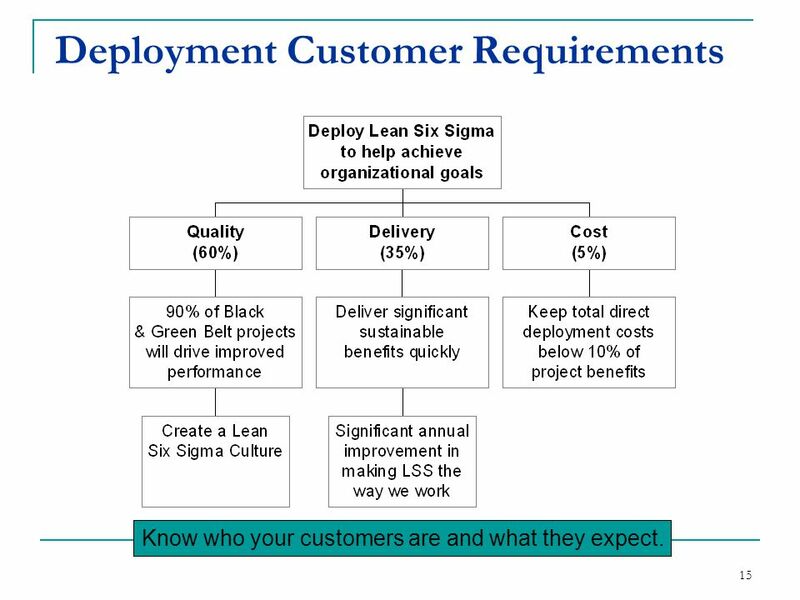 Know who your customers are and what they expect. 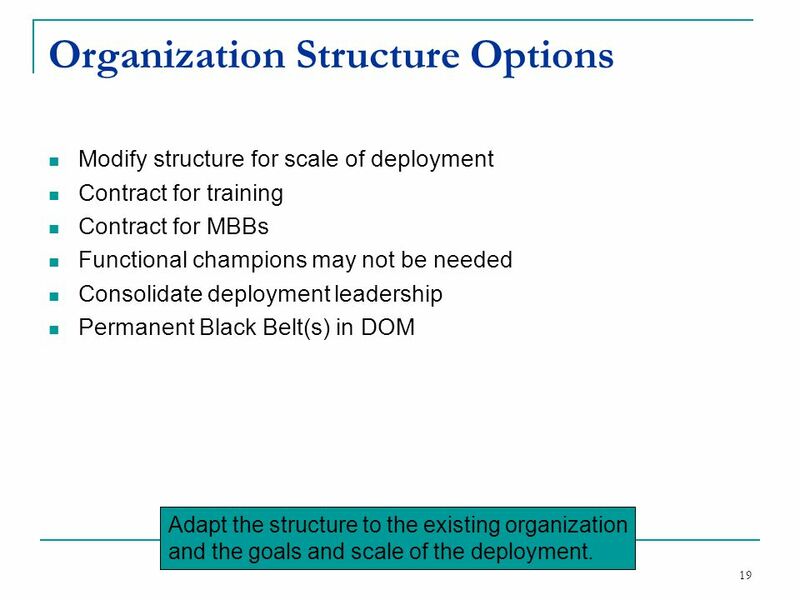 Modify structure for scale of deployment Contract for training Contract for MBBs Functional champions may not be needed Consolidate deployment leadership Permanent Black Belt(s) in DOM Adapt the structure to the existing organization and the goals and scale of the deployment. 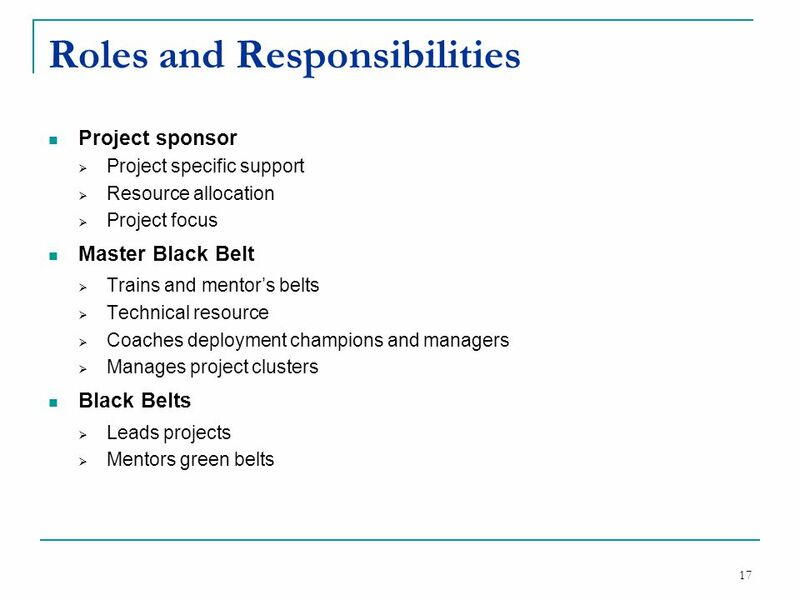 20 Talent Management Rotate top performers through 2 year assignments as Black Belts. 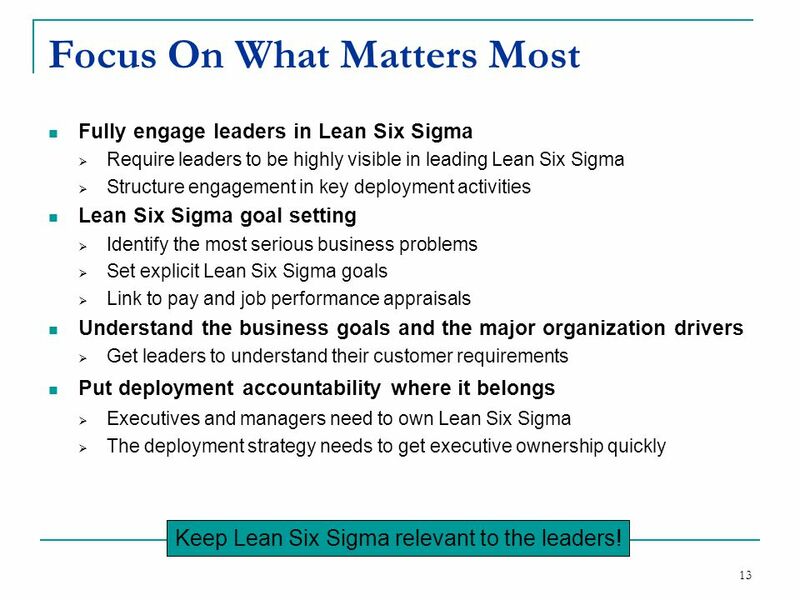 Lean Six Sigma is an outstanding management development experience. 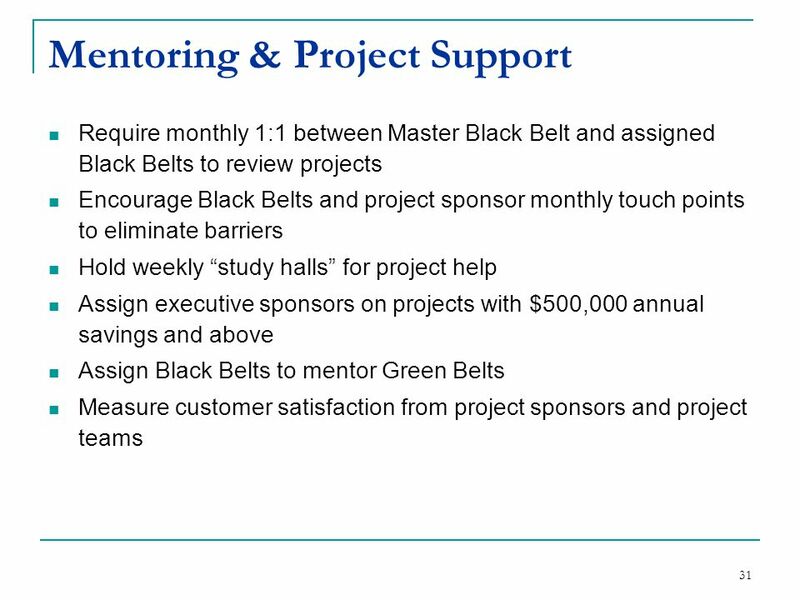 Problem identification Systematic problem solving Managing using data Leadership Select the best and brightest for black belts. Don’t compromise on talent. Plan repatriation. 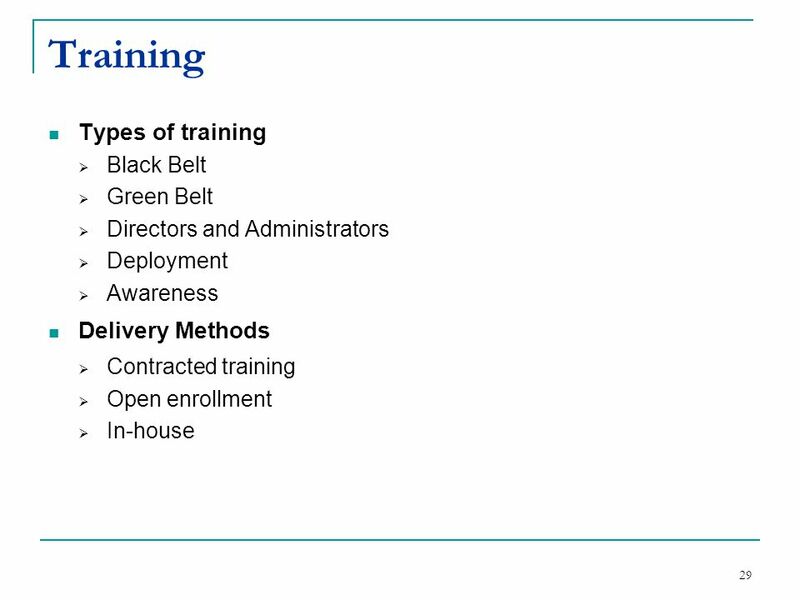 Make Lean Six Sigma experience a requirement for advancement. 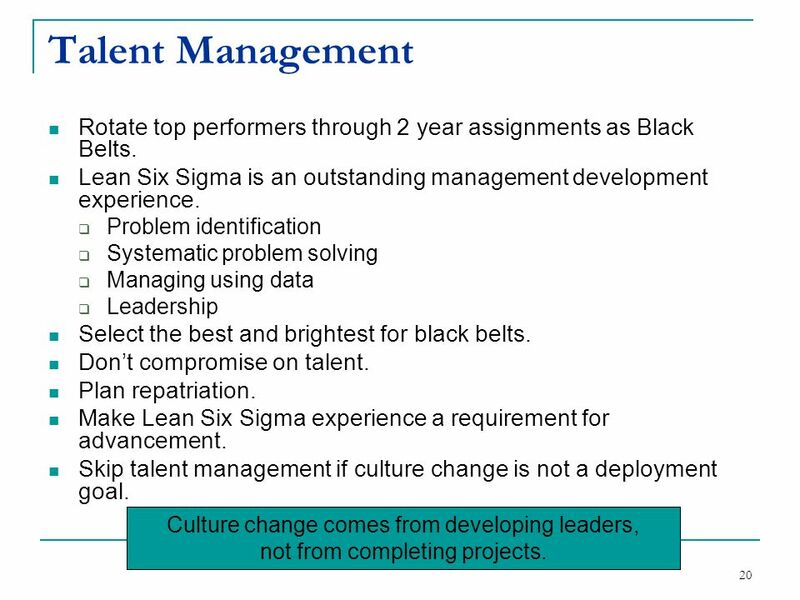 Skip talent management if culture change is not a deployment goal. 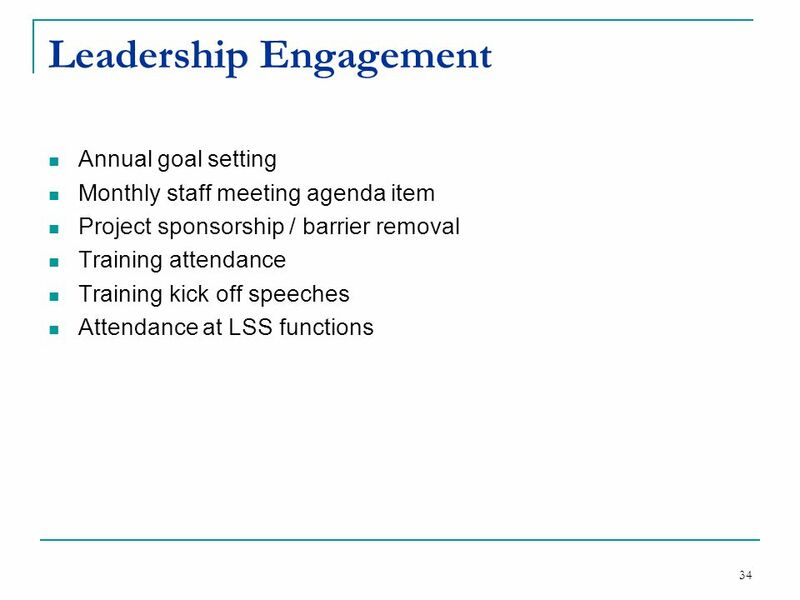 Culture change comes from developing leaders, not from completing projects. Address the people issues early Layoffs Pay Job changes Understand what helps people change What’s in it for me? 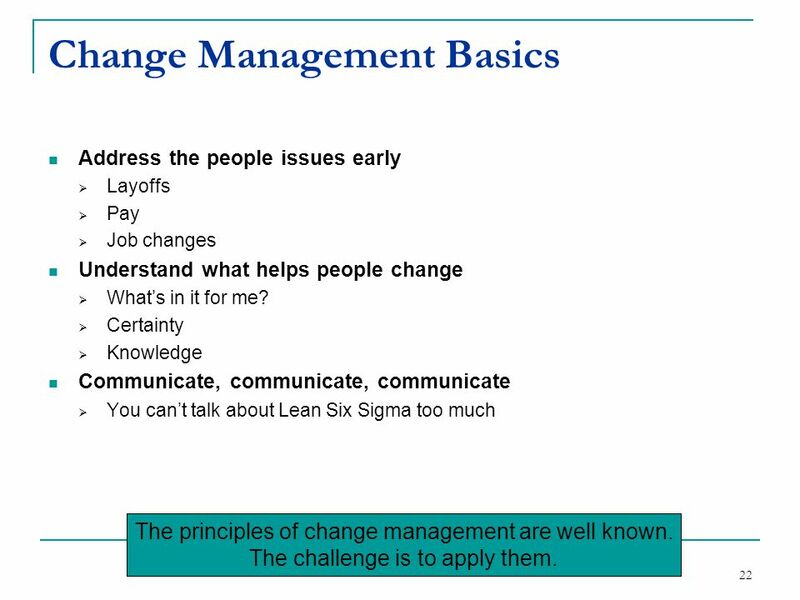 Certainty Knowledge Communicate, communicate, communicate You can’t talk about Lean Six Sigma too much The principles of change management are well known. The challenge is to apply them. 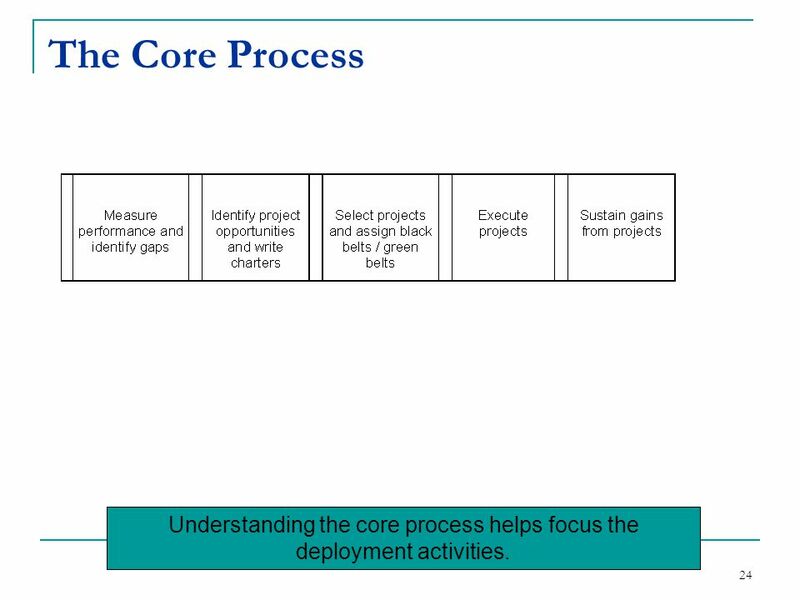 24 Understanding the core process helps focus the deployment activities. 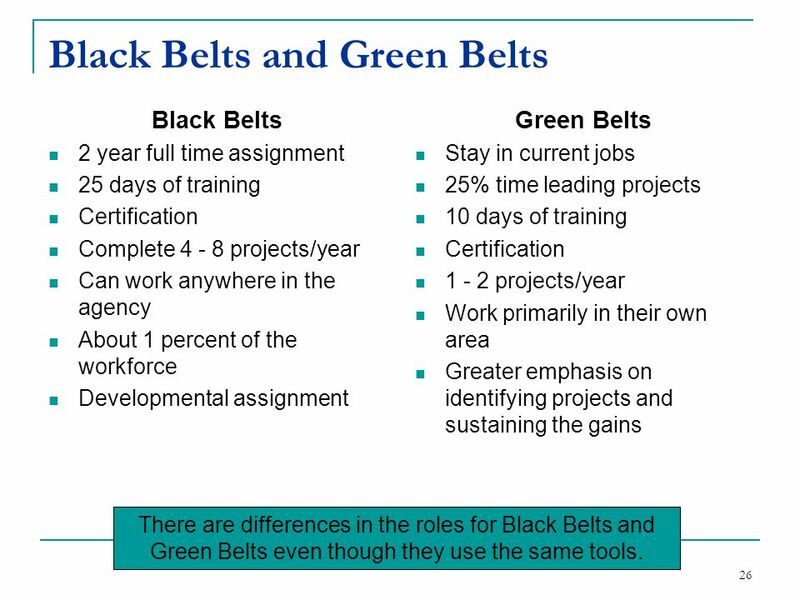 2 year full time assignment 25 days of training Certification Complete projects/year Can work anywhere in the agency About 1 percent of the workforce Developmental assignment Green Belts Stay in current jobs 25% time leading projects 10 days of training Certification 1 - 2 projects/year Work primarily in their own area Greater emphasis on identifying projects and sustaining the gains There are differences in the roles for Black Belts and Green Belts even though they use the same tools. 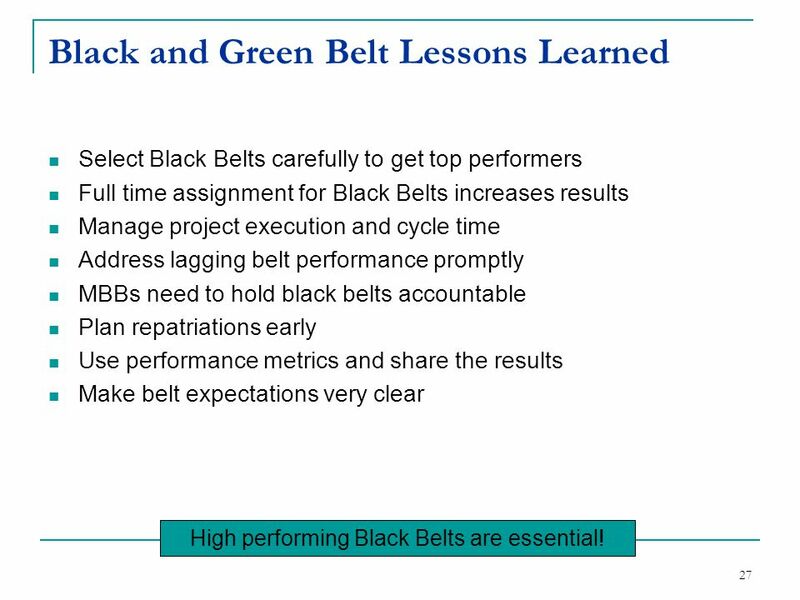 Select Black Belts carefully to get top performers Full time assignment for Black Belts increases results Manage project execution and cycle time Address lagging belt performance promptly MBBs need to hold black belts accountable Plan repatriations early Use performance metrics and share the results Make belt expectations very clear High performing Black Belts are essential! 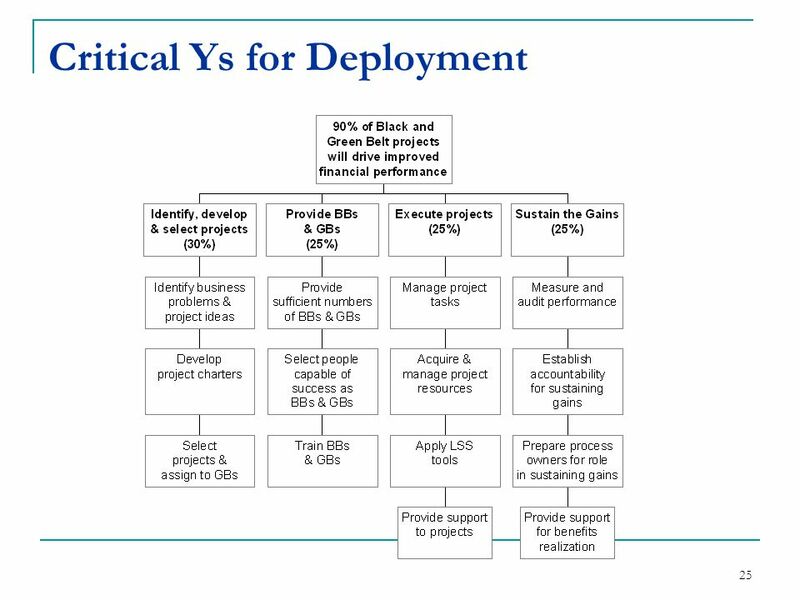 Projects Project idea and charter development process Project financial validation process Project selection process Project management process Audit results process Project database Training Curriculum Statistical software Master Black Belt support Tools and templates Project report outs People Selection process Certification process Repatriation for Black Belts Development plans Rewards and recognition Organizational structure Engagement Build a strong support infrastructure early and stay ahead of deployment support needs. 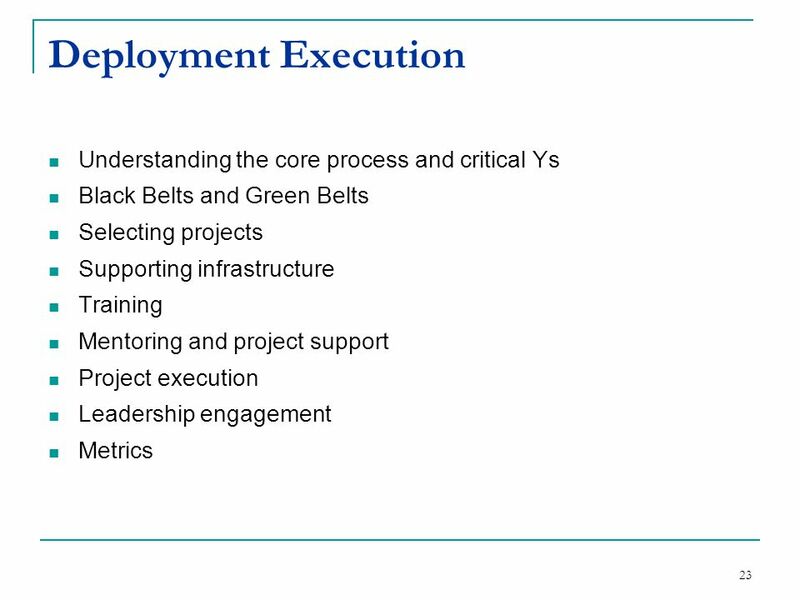 36 Use the deployment to set an example on using data to manage. 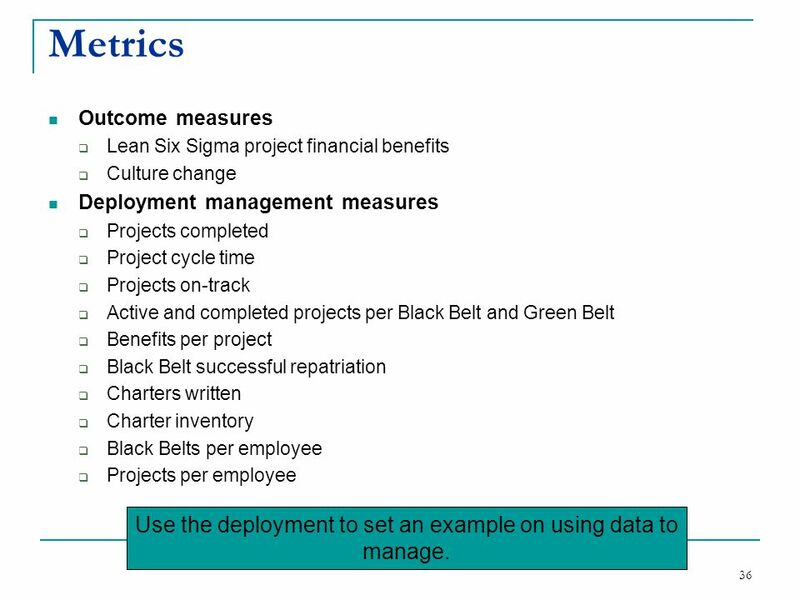 Metrics Outcome measures Lean Six Sigma project financial benefits Culture change Deployment management measures Projects completed Project cycle time Projects on-track Active and completed projects per Black Belt and Green Belt Benefits per project Black Belt successful repatriation Charters written Charter inventory Black Belts per employee Projects per employee Use the deployment to set an example on using data to manage. 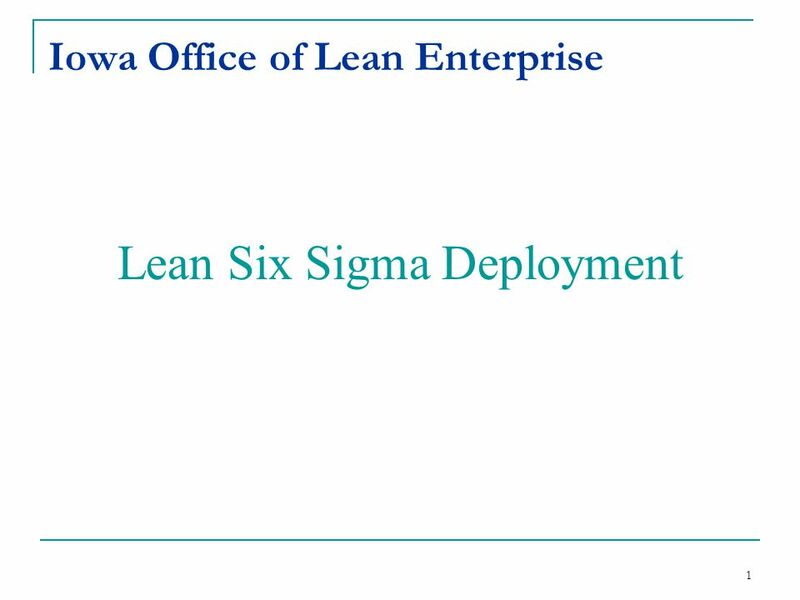 Download ppt "Iowa Office of Lean Enterprise"
NCATS REDESIGN METHODOLOGY A Menu of Redesign Options Six Models for Course Redesign Five Principles of Successful Course Redesign Four Models for Assessing. 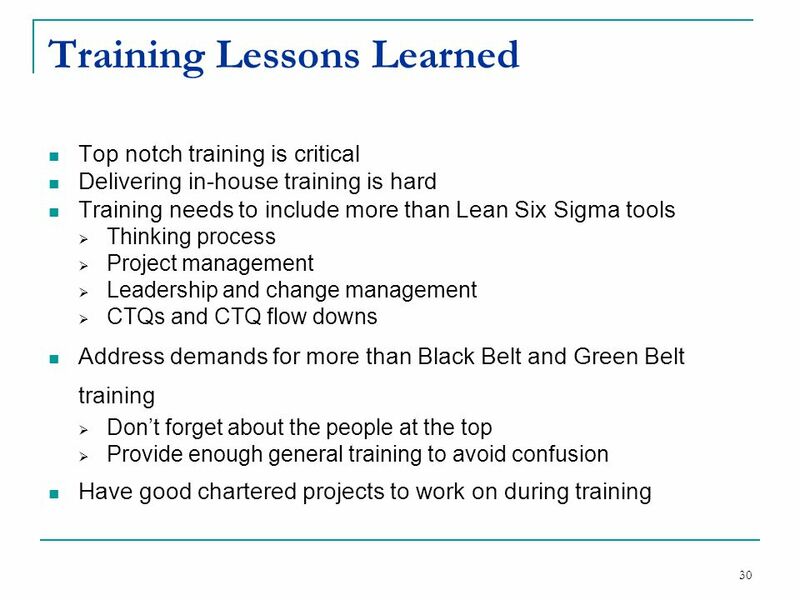 Lean Kaizen Empowering the Team in Interesting Times 14 September 2010 Robin Armstrong Viner Cataloguing Manager Library & Historic. PMBOK® Guide / PMI® / PMP® - 6σ. 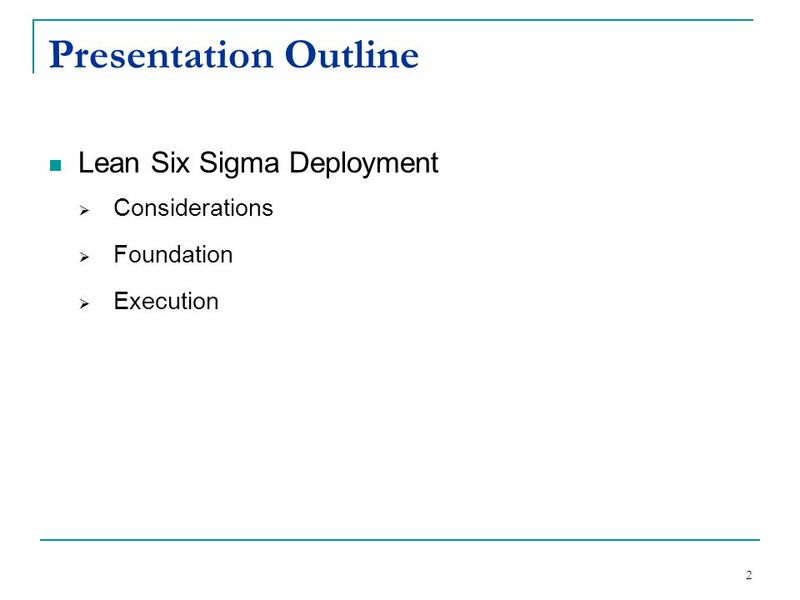 2 Six Sigma (or more recent: Lean Six Sigma) uses projects to attain dramatic improvements in production and services.